A look at some promising players in world football, rating the players potential and if he will make it on the big scene. Scout Report on Birmingham and England u-19 winger Nathan Redmond. Redmond has been a player I’ve admired since he broke into the Birmingham first team in a League Cup tie with Rochdale, at the age of 16. From then on, I’ve always been keeping close tabs on him in the Championship and he has cemented his place into Birmingham’s starting 11. He made 37 appearances for Brum in all competitions last season, which I think that is very impressive, seen as though he is only 18. He scored 7 times for Blues, 5 times in the Championship, once in the Europa League and once in the Fa Cup.His first goal was a brilliant low drive in the Europa League against Nacional, a game where he was at his very best and won the man of the match award. His latest goal was in a 1-0 win over Portsmouth, where he scored the 86th minute winner. Last season’s Fa Cup was the competition where Redmond performed excellently and has talent became noticed. He was outstanding the 3rd round tie against Wolves, playing on both flanks and having a great game. He had many dazzling runs, where Wolves just simply couldn’t get the ball off him, his feet were too quick and his injection of pace was too much for them to handle. He played a key role in the victory and shown his ability, wowing many who were watching. Redmond is a very exciting youngster, he is a very attacking minded player, who thrives on receiving the ball and running at defenders. He is an absolute nightmare to come up against, because he is very unpredictable, you cannot suss out his next move and which way he will run at you. He is incredibly versatile as he can play on both flanks, with the same ability. Redmond is preferably a right-side player, who darts down the right, gets to the byline and provides for the strikers. However he can also play on the opposite wing and it suits his game, due to his long range shooting ability and cutting in from the left-hand side. Another position which Redmond can play in is central midfield or just behind the forward, he occupies this role very well, as he is very good at providing service for frontmen and feeding pasess through to them. He is still only very young and has shown what he is capable of; so I expect him to mature and develop into a very exciting talent, he may have to move on to a bigger club to reach his full potential though, unless Birmingham achieve promotion back to the Premier League. Scout Report on Liverpool’s rising star Suso Fernandez. I have been a fan of Suso for quite a bit now, I was really impressed with his ability when he first caught my eye, when playing for Liverpool reserves against Man United. At the time, I wasn’t too familiar with the player but I have now been monitoring his progress and have been surprised with how quickly he has developed. He arrived in England in 2010, after spending 6 years in the academy at Local side Cadiz CF, he turned down a tempting offer from his boyhood club Real Madrid, and signed for Liverpool. Because he was so young, when Suso moved to Merseyside, it was initially on loan, as he was yet to secure a work permit in England. 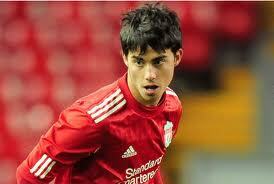 However in November, as Suso turned 17, he penned a professional contract with the Anfield Club. Although, he is yet to have made a competitive appearance for the Reds, he is climbing his way up into the first team though, and was handed his debut for the first team in the recent friendly match against Toronto FC. Suso was among a host of young stars, who are battling to force their way into the first team picture and certainly made a big impression. Suso is also coming through the ranks at International Level aswell, he has progressed from U-17′s through to U-19′s and I expect him to earn a cap for the U-21 side anytime soon. He was cemented his place in the Spanish U-19 starting lineup and was a regular throughout the recent European championships, starting every game. He has made 7 appearances for the U-17′s, scoring 5 times. He failed to strike at U-18 level, but was capped twice. U-19′s was when he really made his mark, he has featured 9 times for La Roja’s young side, netting the 1 goal and playing an intergal part in the European Championship success. I really do rate Suso very highly, I am backing him to force his way into Brendan Roger’s squad, if not I expect him to go on loan and gain some valuable experience, to ensure his is ready when he is called upon. Predominantly, a left-winger, Suso has been transformed into a right-side midfield player, he drifts into central positions, cuts inside on his cultured left-foot and always searches for that killer pass. The 18-year-old is a very exciting winger, blessed with a creative spark, flawless ability and blistering pace, he was good vision and can fire away some shots from distance. I believe he will adapt to Roger’s philosophy very well, he is only slight in build but is a complete and utter magician, Suso is a very talented player and definitely one to watch over the next few years. The first of many scout reports that I will be doing is on Brazillian midfielder Oscar, who is on the verge of signing for Chelsea. Oscar caught the eye of many in 2011, when he netted a stunning hat-trick in the FIFA U-20 World Cup final against Portugal. His performance was outstanding, he was at the heart of everything, dictating play and completely controlling the game. He shone in a Brazil side that boasted the sensational talents and qualities of Neymar and Lucas Moura. Since then Oscar has developed and improved even further, he now has 36 appearances to his name for his Club Internacional and has been capped 6 times for his country, which is very good for a player who is still only 20 years of age. He has only scored 11 goals for the Liga do Brasil side but has contribution to the team has been impeccable. In the recent Olympic warm up match against Team GB, Oscar really caught me eye, I didn’t realise he was that good, he really did impress. He provided the assist for the opening goal and his overall performance was excellent. He controlled the tempo of the game and dictated play throughout. He was up against Ryan Giggs in midfield, a player who possesses a champions league winners medal, numerous premier league medals and a career that has provided many golden moments. Even Giggs was stunned, he found it very difficult to keep Oscar quiet, proving his quality and portraying his talent. I had expected Oscar to hide in the shadow of Neymar, yet the samba star’s impressive display proves that he is equally as good as his compatriot. Oscar is now 20, he is vastly improving and developing all area’s of his game, not that there are many to improve on. He is still only very young and has plenty of time left in his career, although its not bad to be forcing your way into the national team and making a name for yourself on the world stage at such a young age. If he continues the way he is playing, gets his attitude fully sorted and remains confident then if he decides his future lies with Chelsea and the move is secured, the blues will have some player on their books, Oscar has the potential to play at the highest level.